Despite Chinas increasing defence budgets and having the largest Armed Forces in the world, it still continues to manufacturer a second generation Main Battle Tank and rely upon it as its front line of armoured defence, the Type 96. The Type 85, which was developed by China’s North Industries Group Corporation AKA NORINCO, with out Government funding and based on a Type 80 hull, was an export vehicle, whilst the Type 88 (also based on the Type 80) was adopted by the PLA. Though generally most export tanks have a number of minor modifications, the Type 85 looks barely similar to the Type 80/88. The most obvious difference is that the Type 85 has a completely new turret, which is box shaped and of welded construction, compared to the oval shaped cast metal turret. At 39 tonnes, the vehicle was powered by a liquid-cooled, turbo-charged 800hp diesel engine and the traditional stick steering was replaced with a steering wheel and was equipped with the same ISFCS-212 image-stabilised fire-control system as used by the Type 88A. The Type 85-II never simulated any export sales, so an improved model designated the Type 85-IIA was developed in the 1990’s. The Type 85-IIA principal difference was the replacement of the 105mm rifled main gun with a 125mm smoothbore and the reduction of the crew from 3 to 4 thanks to a new autoloader, which meant the turret had to be enlarged, but retained the same FCS as the Type 85-II. The Type 85-IIA was exported to Pakistan from 1991 to 92 and licence built following a number of adaptations for local service, and designated the Type 85-IIAP. Its estimated some 300 are in service. These are said to have been now up-graded to the Type 85-III. A further up-grade saw the implementation of an Image Stabilized Fire Control System (ISFCS) with night vision. The vehicle was re-designated the Type 85-IIM. The Type 85-IIM was then developed by NORINCO in to the Type 85-III and was first seen in 1995. It was equipped with a new 1000hp diesel engine and ERA fitted across the front of the turret and hull. Though offered as an export vehicle, this vehicle was accepted by the PLA for its own use with some modifications as the Type 96 AKA ZTZ96. 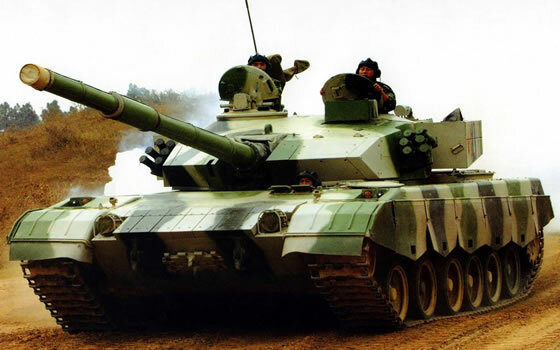 The 96 was the PLA’s first Main Battle Tank, entering production in 1996 and replacing production of the Type 88 which had ended in 1995, which is also a 2nd generation tank. With the introduction of the Type 96, older Type 59’s and Type 69’s started to be withdrawn from service and the 96 started to be equipped amongst the more elite PLA tank regiments. It was the first MBT to be equipped with a large 125mm bore cannon (48cal Length) and is equipped with a thermal sleeve. It was also the first to use frontal modular armour which was installed with an unknown ceramic tile mix. Like all Chinese tanks, the sides and back of the turret are fitted with storage racks, which double up as a form of spaced armour, AKA bar armour. The engine is the same 1000hp diesel of the Type 85-III, giving the vehicle a top road speed of 65km/h and power-to-weight ratio of 24.1hp/t. It also uses torsion bar suspension. It has an operational range of 400km, which is increased to 600km with external fuel tanks. The autoloader as fitted on the Type 85-IIA still keeps the crew reduced to the three. The driver sits on the left at the front of the hull (the engine is still at the rear of the vehicle) gunner is on the left of the turret and the commander on the right. He is responsible for operating the 50. Cal MG which is used in the AA role. The vehicle has a coaxial 7.62mm MG and there are six Type 84 smoke grenade launchers mounted either side of the turret. The vehicle stores 42 rounds of 125mm, 500 rounds of .50 and 2250 rounds of 7.62mm. The FCS is the ISFCS-212 image-stabilised fire-control system as fitted on the Type 85-IIM up-grade, giving an effective rate of fire of 6 to 8 rounds per minute. Entering production in 2006, it replaced production of the earlier model. It has inherited a number of systems from the newer 3rd Generation Type 99, but still lacks the hunter killer capability and still remains a 2nd Generation tank. The most noticeable change has been the beefing of the armoured protection. The old modular armour has been replaced with the Type 99’s angled modular with ERA fitted across it and front of the hull and along the side s of the storage racks of the turret. The gunners sight has a new thermal imaging channel. 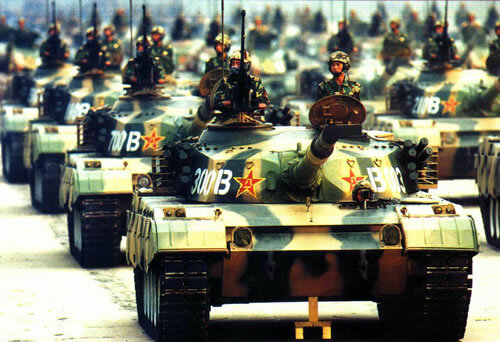 China – The PLA has received between 500 to 1500 Type 96 and Type 96G. The type 96G is still in production for the forcible future despite the production of the superior and more capable 3rd Generation Type 99. Sudan – The Sudanese Army operators 200 Type 96G.